European new car registrations went up by 9.3% in 2015, driven by an SUV boom that contributed to a big part of the total growth. For the first time in the history of European car sales, SUVs led the way, outselling the traditional subcompact and compact segments, posting an increase of 24% at 3.2 million units. Their market share grew from 19.8% in 2014 to 22.5% in 2015, leaving the subcompacts in second position with 22.0% share, and the compacts segment third with 20.6%. These vehicles along with the mid-size sedans/SW and sports cars were the only segments to gain market share in 2015. The SUV growth was in part possible thanks to the outstanding results of the small SUVs, which contributed almost 38% of total SUV segment registrations in 2015. Their volume increased by 38% over 2014, exceeding, for the first time, the one million unit mark at 1.2 million. Despite their strong growth, they were still behind the compact SUVs, which accounted for 40% of the total at 1.28 million units. Small SUVs growth rate was also outperformed by the 42% increase posted by the mid-size SUVs, which totalled 470,400 units. The large SUVs came last with 243,000 units, up by 27% on 2014’s results. SUV registrations grew in all of the 29 countries analysed, with the UK posting the highest volume increase from 501,200 units in 2014 to 630,400 in 2015. Portugal, Spain, Denmark, Croatia and Greece all posted more than 40% growth. In terms of brands, Nissan led the way with more than 376,000 units and 11.8% market share, but its volume percentage growth underperformed the total segments. Once again Renault occupied second position but this time it managed to move faster than its closest competitors in 2014, partly because of the introduction of the new Kadjar that allowed it to post a total increase of 44%. As a result, it moved further ahead of Volkswagen whose registrations remained static (+1.4%). In terms of segment share, Fiat and its new 500X posted the highest gain, followed by Citroen and Jeep. The B and C segments occupied the second and third position respectively, losing one position each. 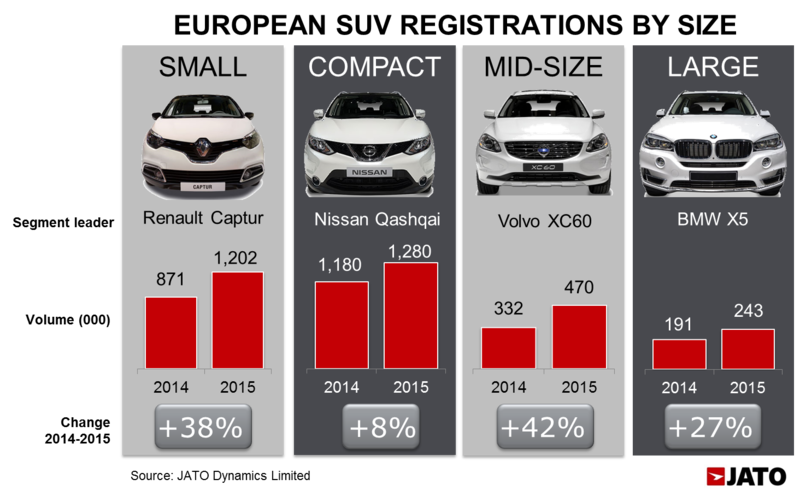 The subcompacts registrations totalled 3.12 million units, up by 5.8% over 2014’s volume. These cars were still the most popular in the Czech Republic, Denmark, France, Greece, Italy, Portugal, Romania, Serbia, Slovakia and Slovenia. The Volkswagen brand led this segment with a 10.5% share, closely followed by Renault at 10.4%, and Ford which placed its Fiesta as the best-selling of the segment. The best performers were Skoda (+18%), Mini (+44%), Mazda (+46%) and Mitsubishi (+35%). Within the compacts, even if the Volkswagen Golf kept its position as the best-selling car in Europe, the overall segment lost market share as its volume only grew by 5.8% compared to 2014. The limited growth was the effect of very low increases coming from Germany, France and the UK, the three largest markets. 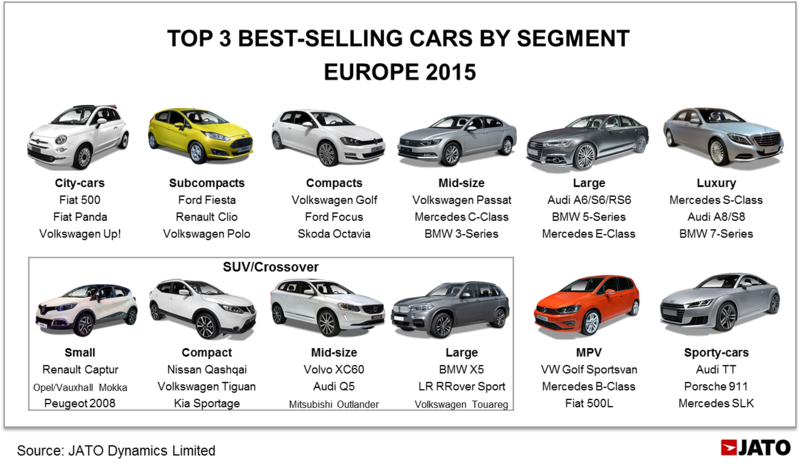 The segment is clearly dominated by the Volkswagen brand, which is quite ahead of Ford and Skoda. Peugeot and Mercedes were the only other brands to post double-digit growth, while Nissan increased its registrations by 153%. (-4.6%) and France (-1.7%), the second largest market. Most of the fall came from the small MPVs whose volume slipped 11.5% compared to 2014, while the compact MPVs benefited from the arrival of BMW and its new 2-Series Active and Gran Tourer. Following the MPVs, the mid-size sedans/SW posted significant growth (+12.8%), outselling the city-cars, with 9.05% market share. The introduction of the new Volkswagen Passat and the good results of the Mercedes C-Class boosted sales. “Similar to the shift towards SUVs in the US car market, Europeans are clearly favouring these vehicles. In 2015 this segment drove most of the growth as more consumers moved away from the traditional segments and MPVs, towards SUVs and crossovers. Both economic and social factors such as the lower fuel prices and the growing appeal of SUVs’ benefits had a big influence on this sales boom” said Felipe Munoz, Global Automotive Analyst at JATO Dynamics.